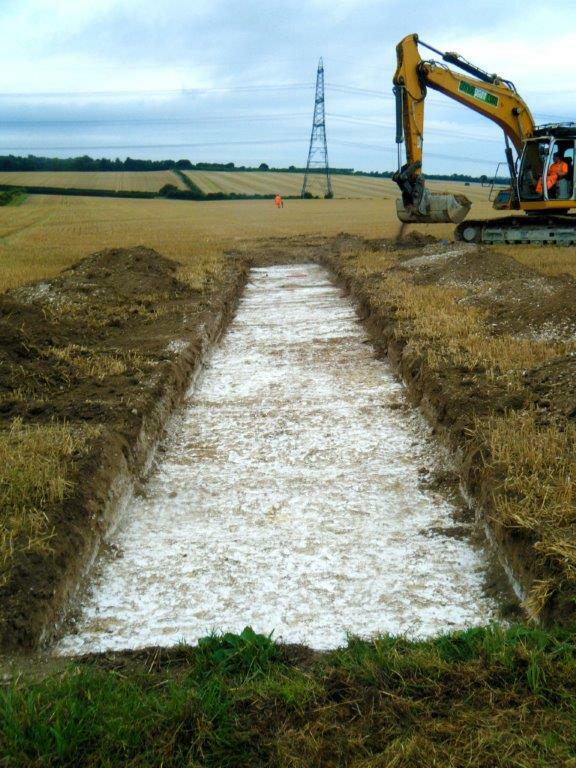 Renewable energy scheme application taking place against a challenging timescale; the development site is located close to the Fleam Dyke Scheduled Monument and to nationally significant, but un-designated, remains of Neolithic flint extraction. A challenging situation for any client when the Consultant-Client relationship is put to the test and deepened (by good service). Our timely, clear advice backed by robust data will allow the client to make an informed choice on the viability of the scheme. The Wadlow Solar Farm lies immediately to the west of Wadlow wind farm, the EIA and mitigation work for which was undertaken by Headland over the period 2008 – 2013. The rolling chalkland in this part of Cambridgeshire contains a number of significant archaeological monuments, including the scheduled Fleam Dyke, a Saxon boundary ditch, which runs close to the site. Nationally significant flint-extraction pits, dating to the Neolithic, were recorded on the adjacent wind farm site. For the most part remains on that scheme were preserved in-situ via micro-siting of turbines. Where this was not possible investigation and publication followed. It was considered possible that similar remains could extend into the Solar Farm application site, though the only remains known via desk-based assessment comprised a crop-mark of possible prehistoric date. Data-gathering via evaluative trial trenching was considered necessary at the site in order to clarify whether further Neolithic extraction pits extended into the development area. We negotiated a combination of trial trenching and bucket sampling (of topsoil) for the site, as these were considered more appropriate in this instance than geophysical survey and/or analysis of aerial photographs. Our contracting staff expertly identified the risk to timescale posed by major utilities adjacent to the scheme. Wayleaves were negotiated well ahead of starting work on the site. The trial trenching and bucket sampling was conducted in a timely way and signed off by the local authority archaeologist. Further pits of possible prehistoric date were identified during the works. Their existence was noted by the local authority archaeologist who required a report with specialist lithic analysis in order to make a recommendation. This report was submitted within the agreed timescale and will now serve as the key document upon which our Consultancy team will shape advice on below-ground archaeological significance, potential impacts and possible mitigation choices. We recognise how key archaeology has become for renewables projects, within which finances and timing are now so keenly balanced. Our robust data with its accurate plans showing significant remains and blank areas is now key for our client as they assess their options.